The increase in the Liberal vote corresponds with the decrease in the Green vote. Just also to note where the heck were the 3 green mlas last night? it's one thing writing the (flase) story outline in advance. but why let it sit anywhere near the "post" button on your website? The relatively dismal turn-out for the Greens is a surprise. I would have thought they'd end up with at least 10%, but they're barely above 7%. Maybe that's in response to not wanting to split the NDP vote, or maybe that's an indicator that the 2017 numbers the Greens garnered were indeed the product of a protest vote against the Liberals. I suspect any momentum and good will the Greens were building with the electorate fizzled when they cut their deal with the NDP. For the Liberal supporters, that suggests the Green are too far left to be a serious replacement. And for the far left supporters, it suggests the Greens are too politically compromised to follow through on promises. Whether or not they can rebuild that goodwill before the next election, I don't know, but I suspect in this by-election, they were never a serious consideration for most folks. They accidentally published both. Likely they wrote both and then for some reason went into the publish queue. Also, CHEK briefly ran numbers from their test earlier in the day live. Excellent thread by Rob Shaw...and Weaver is falling for it hook, line and sinker...every. single. time. 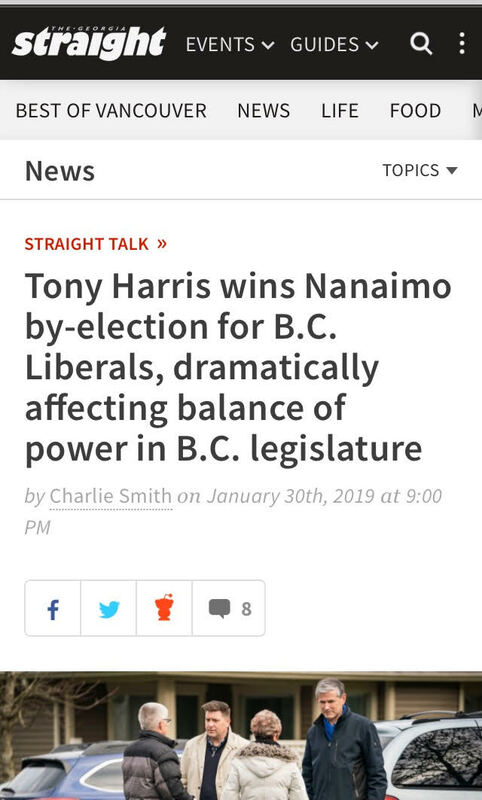 NDP and its surrogates are going to spend a lot of time now propping the Greens back up, reminding everyone how important and a force they are. Because it keeps Greens in power-sharing deal. All the while preparing the next provincial election campaign to destroy them entirely. I think its a "nothing burger". The NDP really hasn't done anything all that much to turn the economy now. They have "eliminated" MSP premiums, the plan to add dental to MSP, there base, isn't going to be upset by the speculation tax, and quite honestly, I can't figure the swing vote that only owns one property being upset by it either. It is just a piece of paper that has to be submitted once a year like a tax return. anybody get their spec tax forms yet? Nope. Some people have apparently. Per today's TC, the final numbers for the Nanaimo byelection, including the absentee ballots. A total of 24,287 valid votes were counted. Prior to the byelection, Elections B.C. estimated there were 45,549 eligible voters. We got ours today, one each for my wife and myself. Took a few minutes to fill out the online questionnaire, pretty easy overall. The letter states in big letters that 99% of people receiving the letter will be exempt, I guess that's trying to make folks feel better but it only made me wonder if only 1% will be paying up, will that amount of tax revenue even cover the costs of implementing this thing? The cost of mailing a letter to every homeowner in the province can't be cheap, plus I'm sure they have full-time staff working on it and of course they had to develop and maintain the website, etc, etc. Sort of a clusterf*ck no matter how you look at it. A friend of ours has found a massive problem with the exemption... no where does it take into consideration a co-signer/guarantor of a mortgage who is listed on title. Because that person is on title but doesn't use the address as his/her primary residence, they're automatically a speculator and are not exempt from paying the tax. This is a huge oversight in a market as overpriced as ours and will likely affect tens-of-thousands, if not more. Hard to believe that this was missed but then politicians are so overpaid that it probably never dawned on them that not everyone just pays cash for houses. Whoever promises to end this debacle in the next election is almost guaranteed to oust the incumbent government (that no one elected). What a disaster. At least there's a 7-day-a-week call centre set up to handle queries/complaints (will the revenue from the 1% even cover the cost of this? ), it'll be interesting to hear how this is resolved. I'm very much looking forward to getting an update the next time we all sit down for coffee. When more than one owner is on title for a residence in a taxable region, each owner claims their relevant exemption as an individual. Different eligibility requirements may apply to different owners. Example: Two parents co-own a house in Victoria with their adult child. The parents live in Alberta. The child claims the principal residence exemption and the parents claim the tenancy exemption for family or other non-arm's-length persons. Example: An elderly parent adds their adult child on title to the parent’s condo in Vancouver for end of life planning. The parent still lives in the condo and the child lives in Prince George. The parent claims the principal residence exemption and the child claims the tenancy exemption for family or other non-arm's-length persons. Edited by Victoria Watcher, 09 February 2019 - 09:10 AM. Jeez that Throne Speech today! If they monetised all the promises we'd be bankrupt! And did I hear right...they want to legislate UNDRIP into Law? Did we get our choo choo train? Yup, legislating UNDRIP will be the final nail in the coffin for major infra projects in this Province. FN finally had a chance for actual prosperity and lifting their people out of poverty and the NDP will kill that dream if they implement this. How brain dead do you have to be to think this is a good idea? Virtue signaling plain and simple. Much like the various CoV requests for the Province and Feds to implement changes that they know have zero chance of being adopted but will help them with certain voting blocks. RE: the spec tax, I looked everywhere on the government site but I can't find the list of questions it asks you before hand. Apparently depending on what answers you provide the following questions change. I'd like the whole list of the questions before I begin. Anyone know where the list is? This thing needs to GO. Even my wife who is apolitical said "why do I need to fill out the same declaration you do?" yeah exactly. If 99% of people are exempt why do I need to fill it out at all? I suspect this is part of something much larger, and much more comprehensive than just the spec tax. This is likely a database that will be used to launch a whole series of taxation measures that will appear in subsequent terms, should the government remain in power. Remember the Liberals’ gun registry? It too was supposed to maintain a database of legal firearms under the guise that it would protect us. But it failed, and failed miserably. The reason? Criminals don’t need legal or locally stolen guns. They have access to a big flow of firearms that have never been registered and never will be. Is this speculation debacle all that different? As pointed out above someone with the means to circumvent the legislation will, while 99% of society is now part of yet another government database and monitoring exercise.